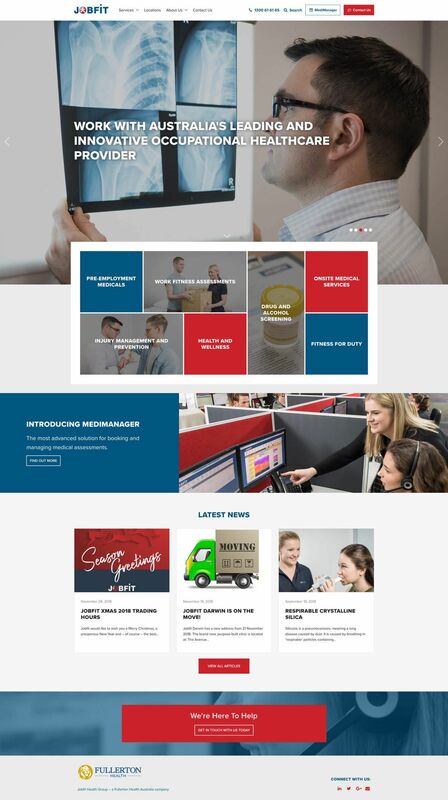 Redeveloped website for the leading occupational healthcare provider with wholly-owned and operated centres across Australia. Jobfit delivers a broad range of services to thousands of businesses nationally, including pre-employment medical assessments, work fitness assessments, injury management and prevention, drug and alcohol screening, onsite medical services, health surveillance, and health and wellness programs. Jobfit Health Group is a division of Fullerton Health Australia. They approached us with some requirements, which they wished to achieve with their new website. The main challenge presented was maintaining Jobfit’s original SEO ranking during development of the new website. Their previous website had an excellent ranking and it was a critical this remained during transition from their old website to the new. Their social media advantage and online marketing services were utilised to create lead generation as part of maintaining their ranking. On top of keeping their ranking, the new website had to show a complete brand refresh – identical to their parent company, Fullerton Health Australia. Jobfit also decided to shift their content management system (CMS) platform to WordPress after previously utilising DNN. Due to this, the web service functionality and structure for their new website needed to reassess in order to obtain their desired outcome and the changing in platforms created an extra challenge for the administrators of the website. By changing CMS platforms, this presented a content migration challenge, as the original content needed to be moved between two very different types of database systems – one Microsoft-based, the other Linux-based – both with extremely different information infrastructure. There were many notable features and highlights of the Jobfit website. The website was completely designed from scratch in order to create a more modern look and feel than the previous site. Additionally, more features such as mobile responsiveness, location search, and live pricing in the quote calculator were developed to modernize and keep it up to date with the technology of the website. To increase the efficiency and effectiveness of the website, the placement of Calls to Action were included in the template when it was designed. Aspects of their parent company, Fullerton Health Australia, were also added to the design to reflect Jobfit and accurately represent the brand. While SEO was a challenge, digital marketing was heavily involved in this project. A number of SEO strategies were implemented, including a Google AdWords campaign to offset the drop in organic search rankings during the website transition. There were also a few design-based strategies when developing the website which were implemented to help boost their Google rankings after the change in platform. Upon website completion, training was conducted for their staff in order to teach them the navigation of their new WordPress system. This resulted in a smooth transition, despite Jobfit’s change in platform and the challenge it initially presented. 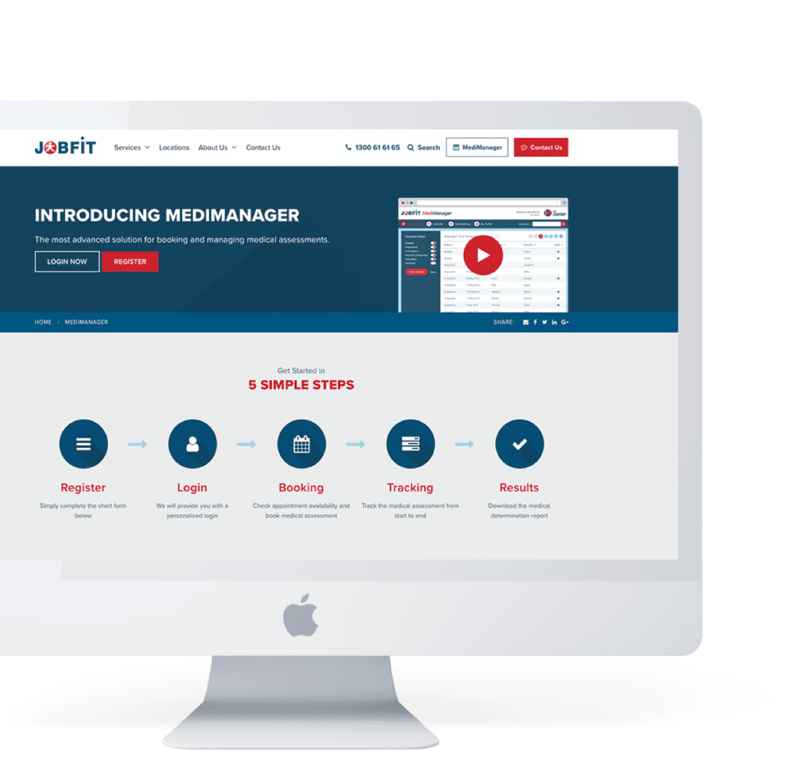 The Jobfit website was built with our own custom CMS, Consul™ specifically designed for business enterprise deployments. The platform is powered by WordPress and provides Jobfit with the benefits of the WordPress CMS, such as its acclaimed ease-of-use content management features such as simple and flexible editing and customisation. In addition to these, Consul™ combines the best features of WordPress with new robust system architecture which can be customised and scaled to deliver the functionality, style and user experience (UX) for advanced business application purposes. The redevelopment of the site in WordPress has eliminated the subscription costs associated with Jobfit’s previous CMS platform and will also provide a platform which is very user-friendly for Jobfit staff. Improvements are continuously improving for the Jobfit website and we predict further positive results in the coming months.